The Hermann Quarter opened its doors at the end of 2008 in Hermannstraße in the Berlin district of Neukölln. The total utilised area is 15,400 m2, spread over 3 floors. Of this, the greater part is taken up by retail areas with a total area of 8,650 m2 on 2 floors. The centrepiece is a shopping mall, but there are also numerous shops, offices and a medical centre. The builders of the mall awarded the contract for the planning of a heating solution that would meet the requirements of efficiency and energy savings to the company MVV Energiedienstleistungen Mitte GmbH, with which a heating supply contract was signed. MVV is part of the MVV Energy Group, one of the leading energy service providers in Germany. What was finally implemented was a complete, tailor-made heating equipment solution. 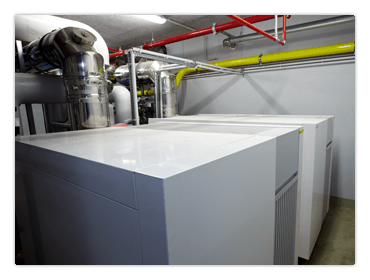 At the heart of the configuration are 2 ELCO gas condensing boilers, the RENDAMAX 2909 and the RENDAMAX 3602, both floor mounted, with a total output of 1,300 kW.